Living off the grid as we do in the Incorporated Village, and by off the grid I mean "off the grid" as in sans cell phone service, we rely on old-fashioned twentieth century means of communication like email and real mail rather than txts. So it is peculiarly quaint that our postal worker only gets to us around 3PM, which means we often don't pick up mail until the next day. 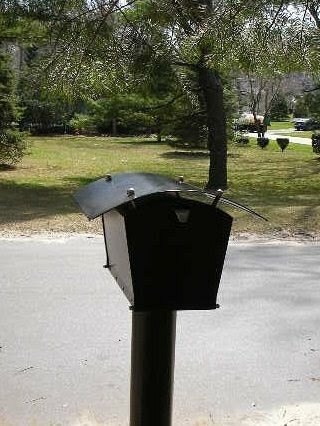 If a landscaper's truck is blocking the mailbox we won't get mail that day either, likewise if we are snowed in or the path is flooded out. It's part of the charm of living in the I.V. Every so often we receive no mail at all, or a box full of someone else's mail, usually the neighbor on one side or the other. Occasionally we get mail for two or three houses and I get to play postman, making sure the letters and magazines get back to their rightful owner. Sometimes I meet other neighbors out there doing the same thing. As I say, it's part of the charm. And I still readdress the mail for the previous owner even though they've been gone for six and a half years. Most of the mail we get is junk and goes straight in the paper recycle but I do subscribe to a couple of magazines so I get a little ticked off when issues go missing. Which brings me to the point of this post. I don't know whether the problem lies in the distribution chain, maybe I should blame New York magazine or the Post Office but, dear neighbors, if you have my copy of New York Magazine for last week, or if you received the other copies that have arrived late or never arrived at all, could you stick them back in your mailbox so Postie can deliver them the next day. Or, if you want to read them first, could you be a little quicker? Thanks.